Downtown Miami’s hottest neighborhood celebrates a property that represents a true architectural icon. Brickell Flatiron is an urban oasis developed by Ugo Colombo’s CMC Group, designed by Luis Revuelta of Revuelta Architecture International, this tower of soaring glass with sweeping exposures is contrasted by the romance of Renaissance-revival interiors with a modern edge. 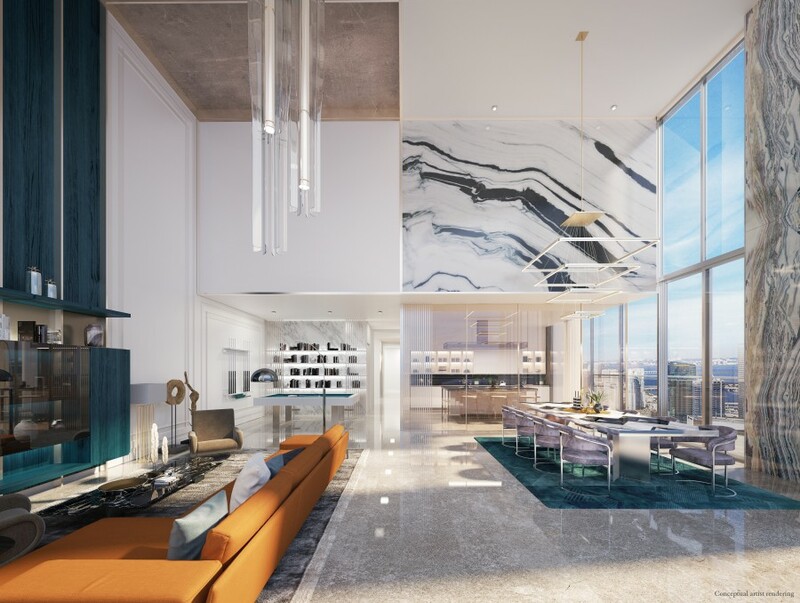 Inside this sleek high-rise, Italian interior designer Massimo Iosa Ghini combines sleek glass walls and curved lines to create a sense of movement – welcoming residences upon arrival with warmth, light and precious stone. The grand lobby incorporates large scale original paintings from renowned artist, Julian Schnabel. Exquisite design paired with fine art creates a masterpiece gallery for residents to enjoy. Brickell Flatiron’s architectural design introduces flowing, curvilinear forms to accommodate spacious floor plans. Panoramic views of Biscayne Bay and the Miami skyline are enhanced by wide, elliptical terraces. An exclusive lap pool and rooftop swimming pool, fitness club and spa offer a limitless 360 degree view of Miami’s landscape. Full service amenities, additional health and meeting facilities, dining and shopping, cater to the comfort and convenience of each resident. Soaring over 700ft in the air, Brickell Flatiron offers inspiring views of Downtown Miami’s cityscape and the glimmering Biscayne Bay. Located in the heart of Downtown Miami, Brickell Flatiron is ideally situated within walking distance of Mary Brickell Village and Brickell City Centre — offering residents unparalleled access to a wide array of fashionable conveniences — with picturesque sidewalk cafés, dining, shopping, markets, outdoor and cultural activities along the way.